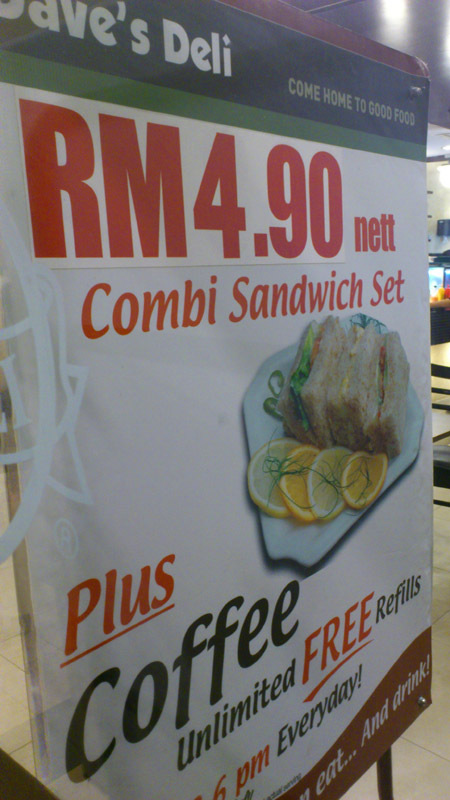 RM 4.90 nett for tea time everyday from 3pm to 6pm called Combi Sandwich Set where 3 sandwiches are given of different ingredients like egg & tuna as well as unlimited coffee or tea with or without milk refills. 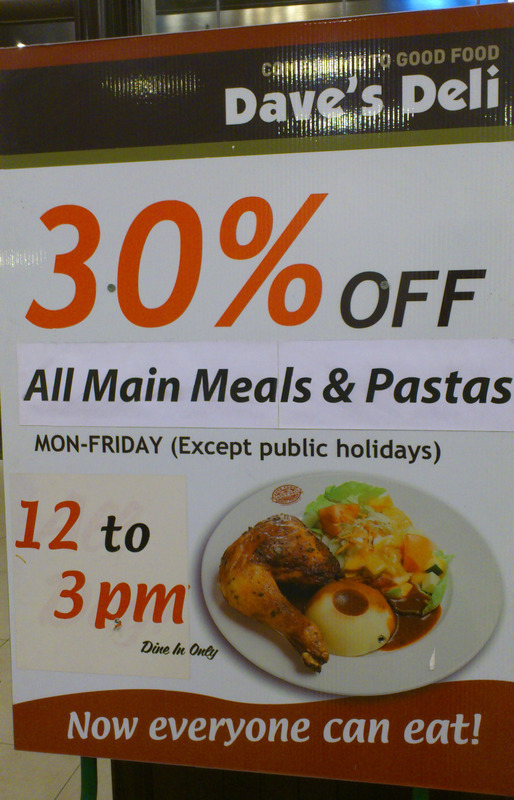 It used to be RM 3.90 nett though maybe a few months ago. The signature dish to go for is the quarter roast chicken meal but the lamb chop is nice too. Unfortunately, I only managed to recently try the fish and chips, which was only RM 11.85 nett as so happen I was abit bored of chicken on that day. 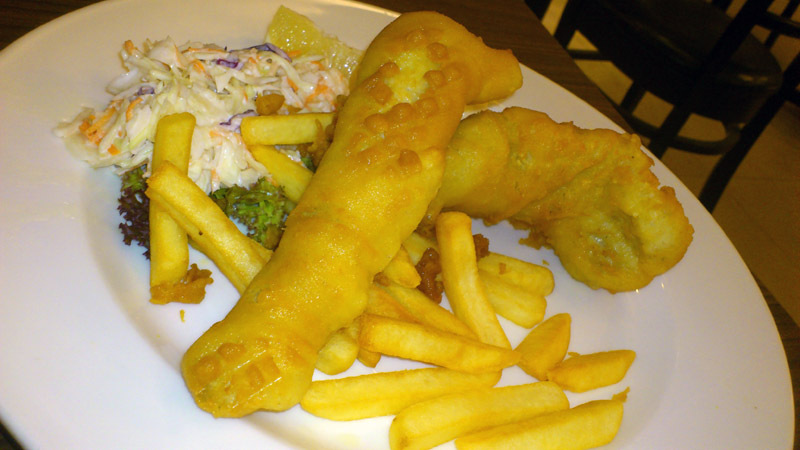 The fish chunks were reasonably big with just a fair amount of thick yummy chips & coleslaw. Coleslaw definitely was better than KFC or Kentucky Fried Chicken with not too much of thick mayonnaise. Fish was however noticeably Dory with the soft texture & a wee bit of earth taste. Cannot complain too much with the price since most places in Malaysia serve dory fish anyway. 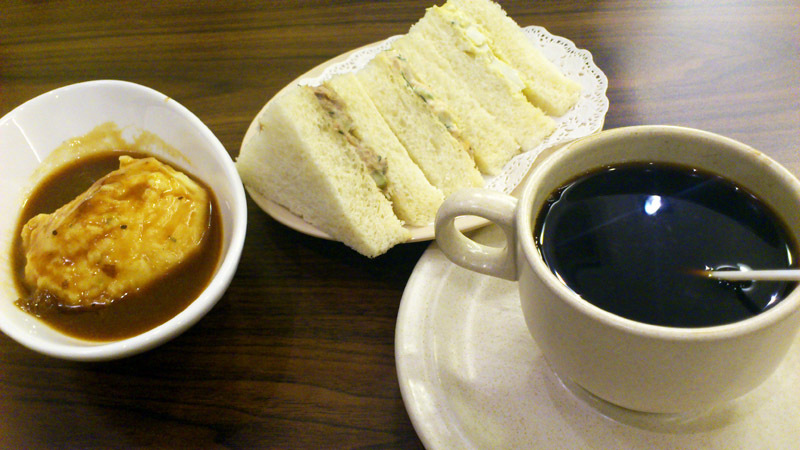 The coffee & tea for the Combi Sandwich Set was thick & warm at all times & the coffee tastes similar to nescafe. However, it feels abit wierd drinking it maybe due to the coffee being reheated after being kept overnight? This maybe possible as there were perhaps only around 10 people there on a weekday. On a positive note, the sandwich was great as the bread was thick with the combination of mayo with the eggs & tuna was just nice. As the banner says, don’t you think now everyone can eat? Oh yes, And drink too for tea time? Ha! A finding I made recently is that Dave’s Deli is also owned by the same owner as Dave’s cafe also at 1 Utama and 99 Steak&Chops in TTDI, where the former two are halal & the latter is non-halal. This entry was posted on Friday, October 21st, 2011 at 7:25 pm	and is filed under Food Promo, Heavenly Klang Valley Food, Western Restaurant. You can follow any responses to this entry through the RSS 2.0 feed. You can leave a response, or trackback from your own site.